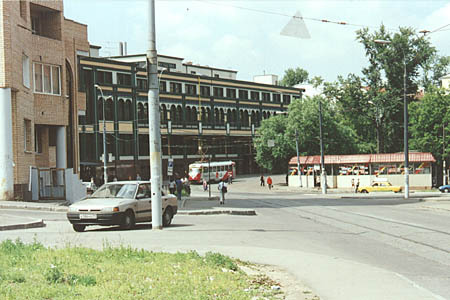 A tramine was constructed here in mid-1930's as a replacement for a closed line along Novoslobodskaya Street. The tram traffic here once was heavy, but on June 16, 1958 tracks along Krasnoproletarskaya Street towards the city centre were closed, and the line became a short cut with a single-track loop through Novovorotnikovskiy Pereulok. The line was for decades served by two routes: #9 and #19, both having the same termini and varying only in the central sections. In mid-nineties route 19 was changed leaving this line with route 9 only. 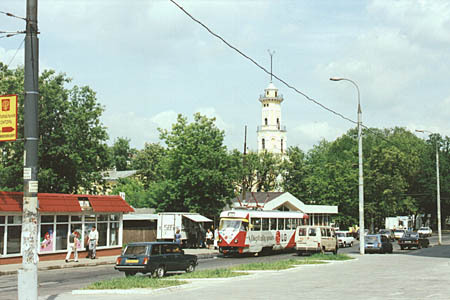 Finally, route #9 was cancelled in 2002 because of closure of the line to Dvintsev terminus, and route 19 was returned back to Novoslobodskaya..
A junction of Seleznevskaya and Sushchevskaya Streets. The dark-green building in the distance is the Chinese trade centre, it was constructed in the second half of 1990's. There was a small open-air market before, and ten years before this place was a bus terminus. 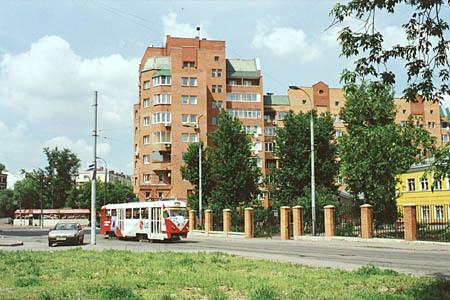 Novovorotnikovskiy Pereulok (Lane). The buildings here have been constructed lately, and just a decade ago this was a disrict of old mansions (a yellow one you can see in this photo - it has survived the reconstruction). The lane makes a curve to join Krasnoproletarskaya street in the distance. 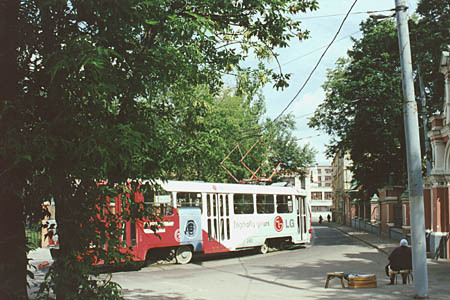 And here is the same tramcar, now making for Sushchevskaya Street. There is an old pale yellow firemen's tower beyond trees, but the style of it differs from the same purpose tower in Sokolniki.